Just had to share this. Discovered this egg amongst our other girls eggs, when doing the usual daily egg collecting. 'Yes, pretty enough egg' I hear you proclaim, 'but why the importance?'. 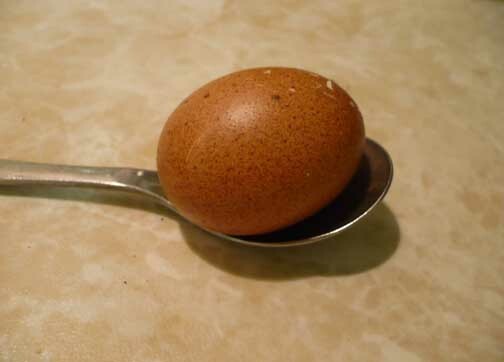 Well this egg is photographed sat in a teaspoon! It's either what's called a *ahem* 'wind' egg, or it's our Izzy's first attempt (she should lay dark brown eggs) or it's Tippi's, who hasn't laid since the dinosaurs roamed the earth. It was yolkless, which doesn't solve the mystery. I've kept the shell. Can't manage to part with it just yet. I'm still tweaking my website and will be glad when it's done and uploaded. We'll be at Teddies 2011! We (Sarah's Bruins) will be at Hugglets Teddies Festival 2011 on Sunday 11th September at Kensington Town Hall, London. After 11 years of bearmaking I have got a stall and am thrilled! It will be wonderful to be at such a prestigious event and for collectors to see my bears (and rabbits!) 'in person'. Lots of sewing for me over the coming months I think! Charlie's listing ending today, Sunday 6th! Charlie's listing is due to end today! Still time to bid if you would like to give this little man a loving bear friendly home! HERE is the link to his listing. Hope everyone is having a lovely weekend. Rather windy here in the UK!